The second book in my personal Journey to The Force Awakens is The Weapon of a Jedi. Luke Skywalker takes a detour to Devaron and searches for knowledge that will help him along the Jedi path. A cool new enemy and some Imperial entanglements combined with some familiar droids makes for a fun little adventure. This book follows the same kind of flashback formula that seems to run through all three of these books. We are introduced to a Resistance X-Wing pilot named Jessika Pava who meets C-3PO in the hangar and realizes who he is and what kinds of stories he can tell. 3PO’s mention of Luke prompts her to inquire about a Luke story not as well known as his other heroic exploits. Pava’s interest in Luke and R2’s history is interesting and shows how the hero’s story has grown and inspired others. I like that from her enthusiasm and interest in stories she reminds me of a young Luke Skywalker herself. 3PO’s story tells of a data retrieval mission shortly after the Battle of Yavin. Luke is regaled as a hero but is still flying with Red Squadron. Together with 3PO and R2, some imperial entanglements force Luke to land on Devaron for repairs. Luke’s recent visions tell him that he must be here for a reason and on approach to the town he spot ruins that he knows are the place the Force wants him to go. Unfortunately no one in the town of Tikaroo will guide him to the Eedit ruins, all saying that the ruins are haunted or off limits. The daughter of the devaronian repairing his Y-Wing, Farnay, tells him she will guide him to the Temple haunted by the sorcerers from the war. She is a brave young adolescent that seems to be a product of the treatment of Devaron by the Imperials. The old ways and customs have changed and now rather than live in harmony with the land and farming, many devaronians earn their creds by taking (imperial) tourists on hunting trips to kill pikhrons. Unfortunately she doesn’t have a suitable mount or supplies to take Luke and his droids into the forest so he ends up hiring a scavenger named Sarco Plank. A faceless armored alien who the others at Tikaroo stay away from. This character appears in The Force Awakens but we don’t know if he’s just a background character or perhaps will have some business or interaction in the main story. I find it interesting that he is referred to as a scavenger so that could possibly come into play. We do know that Rey is also a scavenger…. Luke’s visions guide him to a hidden cave entrance that gets him inside the Imperial perimeter. We might recognize this temple from The Clone Wars. Savage Opress is sent to kill the Jedi on Devaron and he strikes them down outside the temple. Luke uncovers 3 training remotes and trains for a few days at the temple before the Imperials catch up with him and the time comes to put his training to use. Sarco joins the fight with an electrostaff and together they defeat the squad of imps. Then Sarco decides to kill Luke and take his ship, droids, and lightsaber and Luke learns that Lightsabers can’t cut through electrostaffs. Sarco blinds Luke with a flash bomb and Luke uses the Force to defeat him. A cool story beat on Luke connecting with the Force but a bit repetitive seeing as we saw a blinded Luke fight Boba Fett a few months ago in the Star Wars comics. Although Luke definitely seems to be more connected to the Force in this fight it’s still kinda the same track on repeat. I’m also curious as to where this fits into the canon? 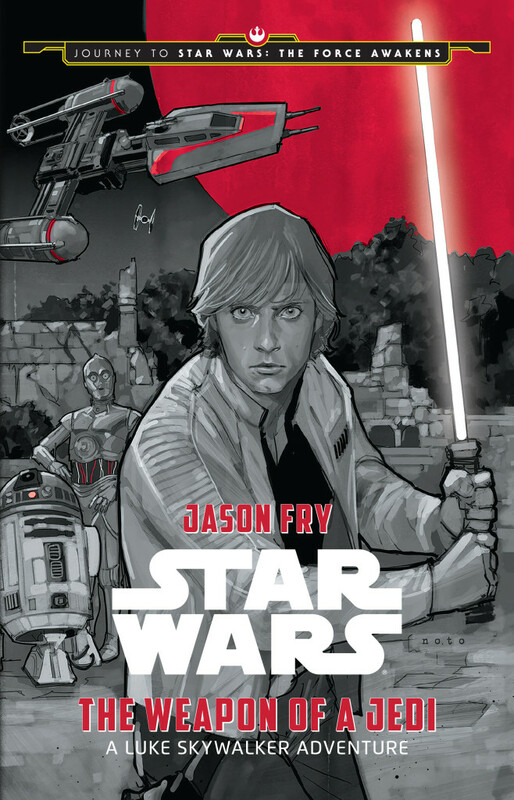 A New Hope > Heir to the Jedi > Star Wars comic so far > The Weapon of a Jedi…. A New Hope > Heir to the Jedi > The Weapon of a Jedi > Star Wars comics…. Just like the Solo book this one is a nice fun Luke adventure that may have some distant ties to The Force Awakens but probably only introduces us to a few characters and places that we may see in that film. I find it interesting that out of these three main character Journey to books this is the one book where the character is not present in the Resistance time. The flashbacks are told by another character. It was fun and another lesson on the Jedi path Luke takes. If you’re interested in a fun short Luke adventure this is it. I'm a guitar playing, song screaming, saber slinging, wall flipping, face kicking Jedi. Star Wars Holiday Special canon?